The quisseh is a rather more abrasive form of shower mit, and is usually fashioned so that you can slide a hand inside it in order to exfoliate the body. These mostly look (and feel) like offcuts of sackcloth. Roushur is the interesting one. Any of you geologists out there? We’d really like to get this stuff analysed. 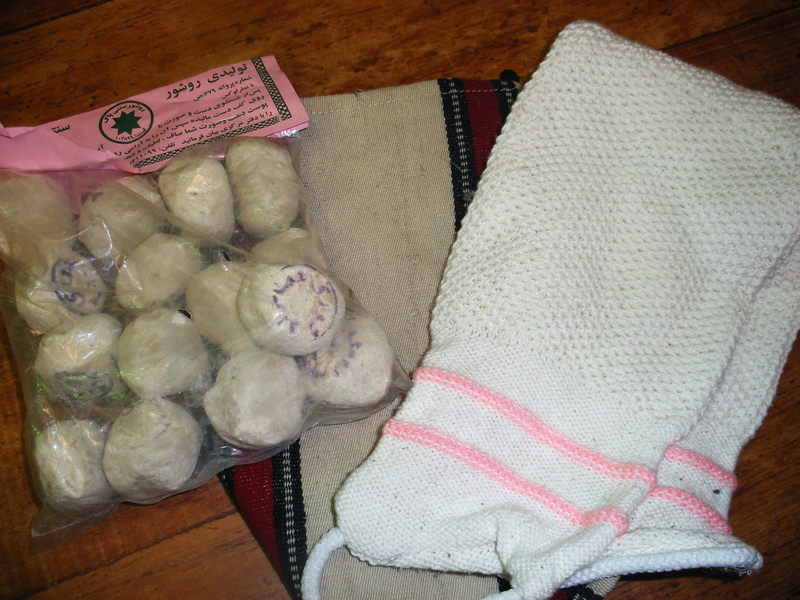 It is a soft mineral substance which dissolves gently in steam leaving the skin soft and supple. Its other name, sefid-ab, is more helpful: the words mean ‘white water’, and some Iranians believe that it actually helps make the skin paler. It’s almost certainly got kaolin in it, and maybe some gypsum. Any which way, they’ve been using it in Iran for millennia, so it must be good, right? 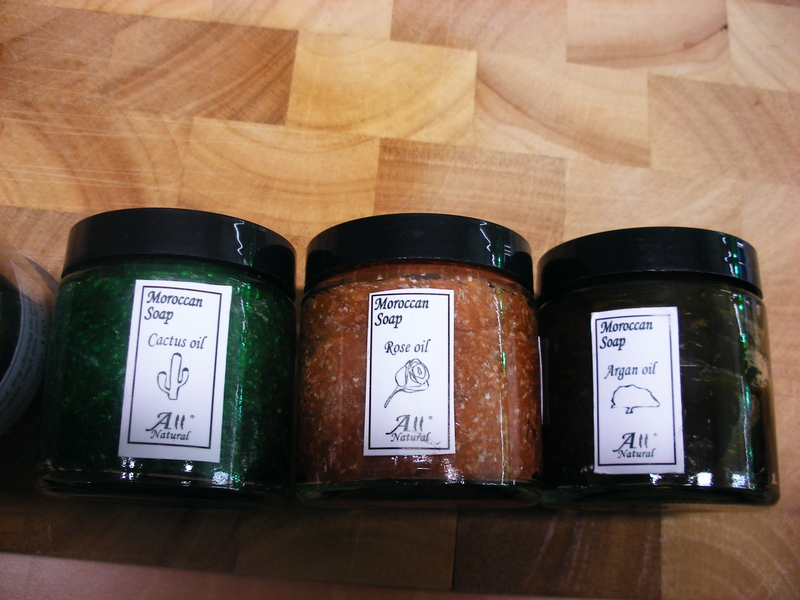 We’ve also got some really posh Moroccan hammam soaps in stock now. There are four on offer, made with rose oil, cactus oil, argan oil or black olive paste. The idea is that you rub it on all over, and allow the steam of your bath or shower to get to work. This is good stuff (yes, in the interests of product research we have tried them all). We are currently selling them at £5.99/pot or two for £10.00. And then there’s argan oil. This unprepossessing liquid is actually farmed from goat poo (well, from argan nuts which have been digested and processed by goats). Yes – of course it’s safe: Berber ladies have known about it for centuries. Now you can use it too. What’s it good for? There are two grades: one for cosmetic purposes, and one for use in the kitchen. We’ve only got the former in stock at the mo. It’s full of vitamin E and is great for rejuvenating the skin. Yep – it apparently makes you look younger. The other good thing about it is the fact that the argan industry is pretty much entirely Fair Trade: all the proceeds go back to the Berber community. *Mrs. Shopkeeper has actually mooted this. Mr. Shopkeeper didn’t look very convinced.